This entry was posted in Motorcycle Profiling Project on March 28, 2019 by Webmaster. 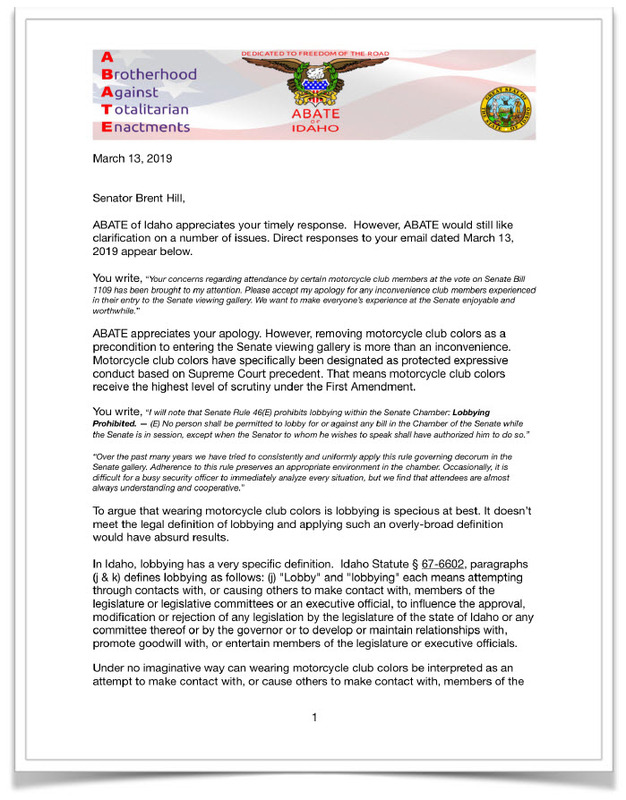 After individuals were forced to remove their motorcycle club colors before entering the Idaho Senate viewing chambers to observe a vote on a bill addressing motorcycle profiling on March 4th, ABATE of Idaho sent a letter to every legislator in Idaho requesting an end to this discriminatory practice on March 8th. The President Pro Tempore, Senator Brent Hill, initially responded by apologizing for any inconvenience, but the policy going forward was not clearly stated in his response. So ABATE of Idaho pressed forward requesting an explicit policy. 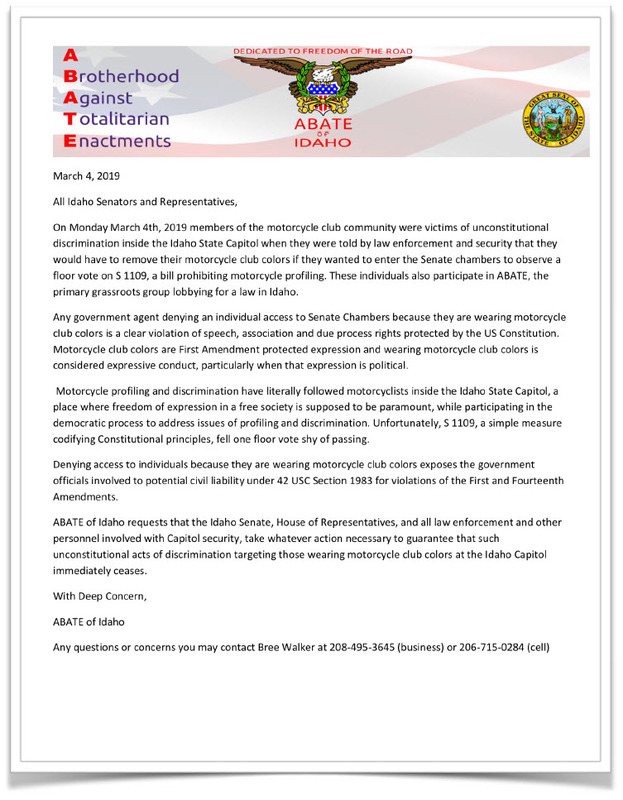 Senator Hill responded in writing that individuals wearing motorcycle club colors would not be denied access to Idaho Senate Chambers going forward. Although S1109, which would have prohibited motorcycle profiling, failed by one vote on the floor of the Senate this year, this incident and outcome move motorcyclists one step closer to legislative protection and further reinforces the importance of fighting back. The post Idaho Senate Apologizes To Motorcyclists Forced To Remove Colors appeared first on Motorcycle Profiling Project. This entry was posted in Motorcycle Profiling Project on March 25, 2019 by Webmaster. 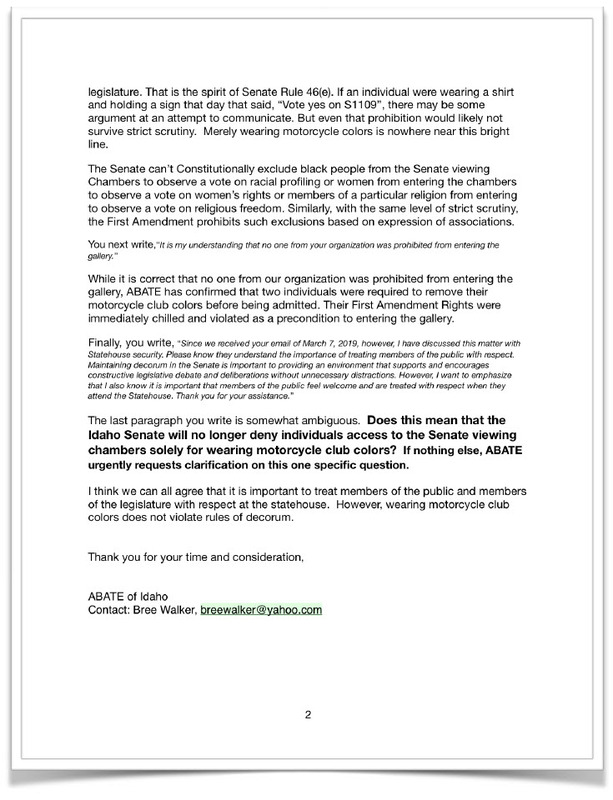 On Monday March 4th, 2019 members of the motorcycle club community were victims of unconstitutional discrimination inside the Idaho State Capitol when they were told by Capitol Security personnel that they would have to remove their motorcycle club colors if they wanted to enter the Senate chambers to observe a floor vote on S 1109, a bill prohibiting motorcycle profiling. These individuals (one a member of the Brother Speed MC and one an associate of the Vagos MC) also participate in ABATE, the primary grassroots group lobbying for a law in Idaho, and complied in order to watch the vote. ABATE of Idaho responded by sending a cease and desist request to every legislator in Boise on Friday, March 8th, 2019. Bree Walker, representing ABATE of Idaho, reported to the MPP that she talked with the Capitol Security Oﬃcer that denied MC members wearing colors access on March 4th and confirmed that the Idaho Senate Sergeant at Arms; Sarah Jane McDonald, ssgt@senate.idaho.gov, (208) 332-1400, was responsible for giving the order. 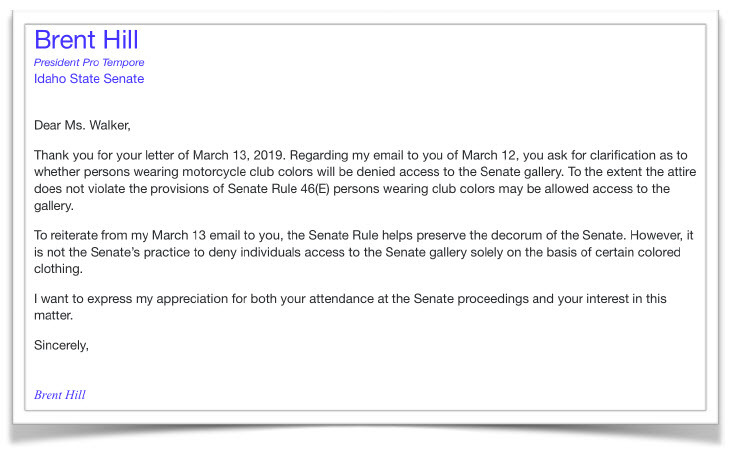 There is nothing in the Senate Rules that would prohibit motorcycle club colors. That’s freedom of expression. Why would there be? It appears that evidence of motorcycle profiling in Idaho can no longer be denied. The post No MC Colors Allowed in Idaho Senate for Profiling Bill Vote appeared first on Motorcycle Profiling Project. This entry was posted in Motorcycle Profiling Project on March 11, 2019 by Webmaster. The MPP has heavily reported on the recent trend of individuals being arrested for possession of handguns merely for membership in a motorcycle club. This includes individuals with no criminal records and License To Carry holder’s. The MPP has even issued a travel warning to motorcyclists traveling through Texas. One such case against a member of the Bandidos Motorcycle Club (Ashley Becker) in Lubbock, TX continues with a refiling of charges for Unlawful Carry for mere membership in the club, which authorities label a criminal street gang. Law enforcement and prosecutors should dismiss all such cases in the name of justice because they rely on an unconstitutional application of statute which ignores the basic principle of personal guilt. Texas Penal Code 46.02, the statute prohibiting gang members from carrying weapons, is being misapplied to individuals simply for being members of motorcycle clubs. 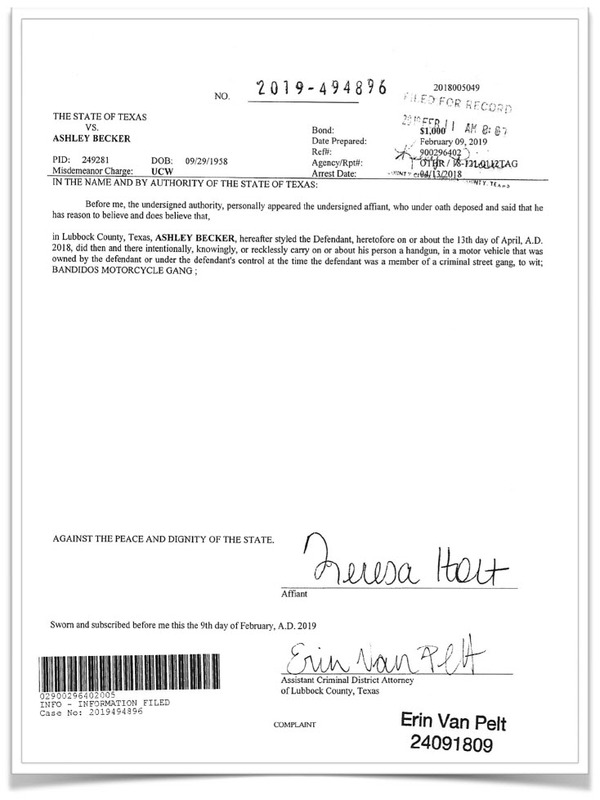 Take Ashley Becker, who was originally charged with Unlawful Carry and suspicion of possessing a controlled substance in Lubbock, Texas in 2018. The weapon wasn’t illegal, and no crime was committed. He was arrested under 46.02 for being a Bandido in possession of an otherwise legal weapon. The alleged controlled substance, after being tested multiple times, turned out to be inconclusive. Although the 2018 indictment was dismissed without prejudice, on February 9, 2019 charges were refilled against Becker on the Unlawful Carry charges. The aﬃdavit identifies Becker’s membership in the Bandidos as the only probable cause for arrest. Authorities persist despite absurd, unconstitutional interpretation of law. Despite the fact that their interpretation of statute is unconstitutional and in violation of established state and federal rules of evidence, law enforcement and prosecutors persist in wasting public resources targeting individuals like Becker for participating in Constitutionally protected expression and association. This absurd interpretation of 46.02 would mean that carrying a weapon is unlawful for any individual that is a member of the Bandidos Motorcycle Club, with no other evidence, even with a License to Carry. In the name of justice, prosecutors in Lubbock should again file a motion to dismiss all charges against Becker, this time with prejudice. Furthermore, prosecutors and law enforcement in El Paso, Dallas, and across the state of Texas should follow suite. After motorcycle clubs, who’s next? Everyone should ask themselves, “After motorcycle clubs, who’s next?” Every large identifiable group has individuals that have committed crimes. Should your civil liberties be taken based on the actions of other individuals you associate with even if you had no involvement in criminal activity? The blatant attempt to disarm the entire community regardless of an individual’s personal involvement in criminal activity will not stop with motorcycle clubs if authorities are successful. Every American should be deeply concerned about this assault on basic civil liberties. Unpopular speech, including unpopular association, is the most important speech to protect. Or so long has held the Supreme Court. The post Texas Man Charged with Unlawful Carry Solely for Being a Bandido appeared first on Motorcycle Profiling Project. This entry was posted in Motorcycle Profiling Project on March 7, 2019 by Webmaster. 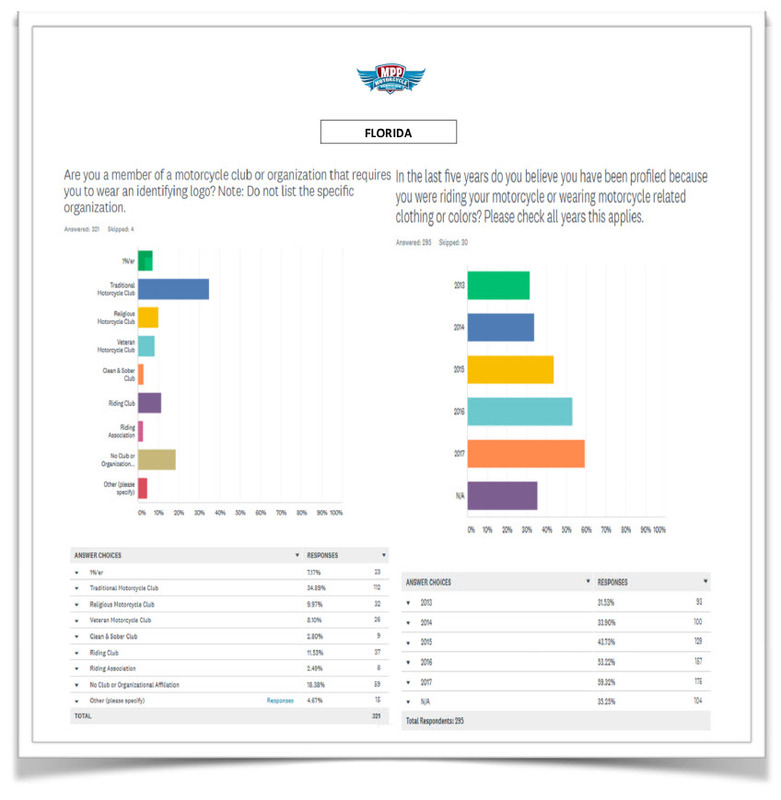 The National Motorcycle Profiling Survey validates the Florida’s profiling epidemic. The 2018 NMPS lists Florida as one of the top motorcycle profiling concerns in America. According to the 2018 NMPS, 65% of Florida survey participants reported being the victims of motorcycle profiling at least once since 2012. These survey statistics are 99% reliable with less than a 2% margin of error. (See NMPS Executive Summary 2018). The post Motorcycle Profiling is Oﬃcial Daytona PD Policy appeared first on Motorcycle Profiling Project. This entry was posted in Motorcycle Profiling Project on March 2, 2019 by Webmaster. Although this is a major victory, it is likely not over yet. Using the past as an indicator, the MPP believes that the government will likely appeal Judge Carter’s decision. But this decision gives hope that the constitutional principles at stake will continue to prevail against overzealous prosecutions. 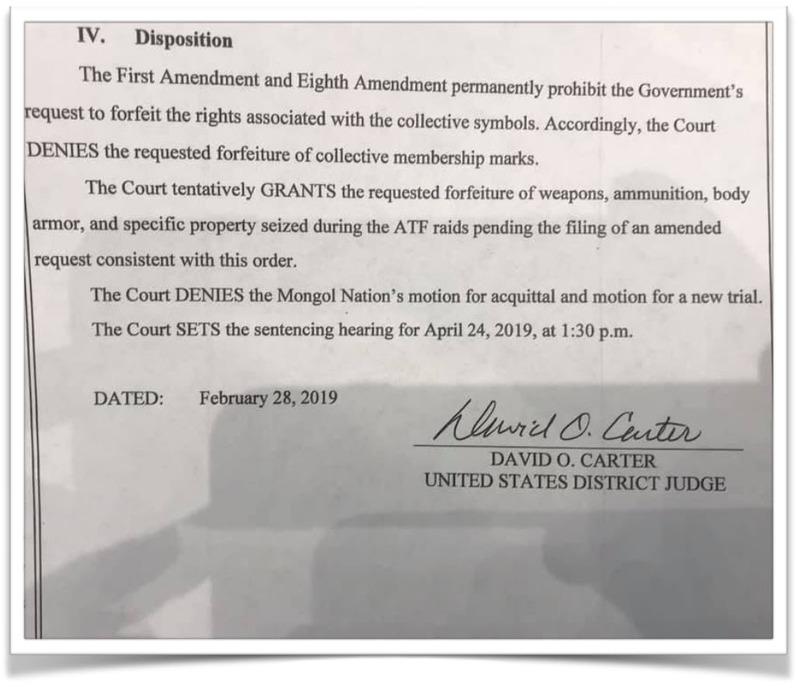 Judge Carter denied the government’s request for the Mongols Nation to forfeit rights associated with the Mongols collective membership marks, including their name and center- patch. This means Judge Carter has set aside the jury’s grant of forfeiture in phase 2 of the trial based on the First and Eighth Amendments. However, Carter tentatively granted the requested forfeiture of weapons, ammunition, body armor, and specific property seized during the ATF raids pending the filing of an amended request consistent with this order. Finally, Carter denied the Mongols Nation’s motion for acquittal and motion for a new trial. This means that the jury’s Guilty verdict in phase 1 of the trial (guilt phase) stands. The Mongols Nation as an entity, defined as all patched members of the Mongols Motorcycle Club, has been found guilty under the RICO statute. Carter then set the Sentencing Hearing for April 24, 2019 at 1:30pm. Save The Patch- What happens next? The MPP believes the government will likely appeal Carter’s denial of forfeiture. And if history repeats itself, the ACLU will also step up as they did in Rivera v. Ronnie A. Carter, Acting Director, ATF; et al. Rivera was an un-indicted member of the Mongols MC that filed a lawsuit fighting the government’s previous patch seizure attempt. Why does the MPP believe that the ACLU will step up? Because they already have by filing an Amicus brief (requested comment by friends of the court) in support of the Mongols preceding phase 3 of the trial, authored by David Loy, Legal Director for the ACLU of San Diego, who also represented Rivera. Loy successfully recovered attorney fees following the decision. The ACLU specializes in First Amendment law and Loy has repeatedly demonstrated prowess with the Mongols struggle to defend their right to express and associate. Their attention to this case bodes well for motorcycle clubs and civil liberties in general. The post Judge Carter Says Government Can’t Seize Mongols MC Patch appeared first on Motorcycle Profiling Project. This entry was posted in Motorcycle Profiling Project on February 28, 2019 by Webmaster. The same jury that found the Mongols Nation Guilty of racketeering and conspiracy in the federal RICO case US v. Mongols Nation has also decided that the club should forfeit their patch because there was a nexus between the Mongols MC’s collective membership marks and conspiracy. However, Judge Carter has not issued a forfeiture order until objections based on the First Amendment are decided at the end of February. Even then, this case is a very long way from its final conclusion. This entry was posted in Motorcycle Profiling Project on January 15, 2019 by Webmaster. For the first time in history, in its latest bid to seize the Mongols Motorcycle Club’s logos and collective membership marks, the federal government has successfully indicted every single full-patched member of a motorcycle club on felony RICO racketeering and conspiracy charges regardless of personal guilt. So, what happens next? What does this verdict mean for the Mongols MC, other motorcycle clubs in America, and the First Amendment to the US Constitution? There are definitely more questions than answers. But one thing is certain. The fight to Save The Patch is far from over. Now, more than ever, motorcycle clubs have a critical issue to mobilize around in order to preserve and insure the survival of a lifestyle and a culture. On December 13th, 2018, the Mongols Nation, defined as all full-patched members of the Mongols Motorcycle Club, was found guilty by a federal district court jury in Southern California under the federal RICO Act of racketeering and conspiring to engage in racketeering, for conducting and participating in the criminal enterprise called the Mongols Gang. The Mongols Gang is defined by the federal government as all patched members, prospects, and associates of the club. The federal government argued that, since 2002, the Mongols Gang has committed crimes ranging from drug dealing to murder at the direction and benefit of the Mongols Nation. No one goes to jail? Despite a verdict of guilt, no one will be incarcerated as a result. The crimes cited are historical and, in many cases, resolved. The goal here is diﬀerent. The government maintains that the club’s insignia and patches are an element of the criminal enterprise and a tool of intimidation. If the government gets its way during the sentencing phase, prosecutors argue they will literally be able to take the colors off a Mongol’s back. The implications for the motorcycle club community at large are obvious. The federal government’s forfeiture strategy could ultimately be applied to other clubs in an attempt to crush the symbolism that defines association in motorcycle clubs. And completely independent of forfeiture, the idea that an entire motorcycle club can be defined as a criminal enterprise regardless of personal guilt also lays the foundation for other severe sentencing options such as excessive fines and asset forfeiture. Personal guilt and the 1st Amendment. Beyond immediate impacts to the Mongols MC, the US Attorney’s theory of prosecution compromises important judicial principles such as the doctrine of personal guilt, guilt by association, and the fundamental concepts of First Amendment Association and Expression. Indeed, the prosecution’s theory obliterates long-standing constitutional principles. Independent of collective membership mark issues, and even though no one is going to jail as a result this verdict, what are the potential implications of the Mongols Nation- meaning every member of the Mongols MC- being found guilty of two felony RICO counts? No individual person is specifically named in the indictment. But every member they want to seize property from must be an indicted individual in order to avoid the same judgement that gave the Mongols back their property initially. Does this mean that every member of the club now has a felony record? Does this mean that members can be denied rights like voting and legal possession of a firearm? Does this mean that the Mongols MC has no 1st Amendment right to associate with one another because all patched members, the Mongols Nation, have been found to all be engaged in a criminal enterprise? These questions, at least to the MPP, remain unanswered. So much focus has, understandably, been placed on the patch forfeiture issue that many of these questions haven’t yet been considered by those discussing and writing about this case. The potential impacts are vast. Australia has no 1st Amendment so banning motorcycle club associations does not face the same obstacles as in America. The prosecution’s strategy in this case is, the MPP believes, the government’s most recent blueprint for circumventing the 1st Amendment and crushing motorcycle clubs in America. The US v. Mongols Nation Trial, despite a guilty verdict, is still a long way from being over. After the first of the year, the jury will reconvene, enter the sentencing phase, and decide whether they agree with the government’s forfeiture requests. And even if the jury grants forfeiture, Judge Carter must then adjudicate the extensive legal and constitutional objections to forfeiture. Fortunately, even if unsuccessful in every phase of this federal district court trial, the Mongols MC can appeal the decision as they previously did when they lost their patch in district court before overturned on appeal. Unfortunately, there is no guarantee what will happen in the interim if the Mongols marks are seized. If history repeats itself, the Mongols MC will be targeted, harassed, and have property and colors seized by authorities. Make no mistake. This is NOT just about the Mongols MC. In a very real way, the motorcycle club lifestyle is under heavy attack and survival is not assured. This verdict demonstrates that reality. So, the community must not only continue to fight the good fight- the community must win. The post Every Mongols MC Member Found Guilty in Patch Seizure RICO Case appeared first on Motorcycle Profiling Project. This entry was posted in Motorcycle Profiling Project on December 15, 2018 by Webmaster. The government’s goal in this case is to take a motorcycle club’s identity by giving law enforcement the legal right to force members to forfeit their colors and property bearing the Mongols MC marks. The jury now is deliberating on the guilt phase of the trial. Their decision could potentially impact the entire motorcycle club world and also limit the fundamental rights of freedom of expression and association for all Americans. “US Attorney Welk’s entire argument is framed around the outright mocking of motorcycle culture,” says the trial observer. “It’s clear- motorcycle culture is on trial. If someone attacks you, the government wants you to retreat like a coward, and call the police. The government is trying to make it part of a crime if bikers don’t conform to their own set of morals and values,” says the trial observer. “The US Attorney wants to dictate whether a biker ok lady should be allowed to wear a property vest, of her own free will. If not, the Department of Justice will try to make you pay, not only with criminal charges, but with the cruel and unusual punishment of having to listen to US Attorney Welk ramble on about it for hours, while laughing alone to his own jokes…and it’s an awkward, nerve-cringing laugh too. Oh God, please make him stop,” says the observer. According to the trial observer, Yanny’s closing set the burden of proof and gave an inspiring history on the founding fathers and power of the jury. Who more effectively made their argument? Soon, the decision will be in the hands of the 12 people whos opinion matters the most in this phase of the case. Predictably the government’s argument is based around a stereotype crafted by making generalizations about motorcycle club culture based on the actions of the few. In this case, the actions of individuals that have long ago been prosecuted. In fact, if the jury brings back a verdict of guilty no one will go to jail. But they would lose their right to express their association to the Mongols MC. This violates the fundamental concepts of personal guilt and freedom of expression. There is “no evidence that by merely wearing [1% motorcycle club] “colors,” an individual is “involved in or associated with the alleged violent or criminal activity of other [1% motorcycle club] members. It is a fundamental principle that the government may not impose restrictions on an individual “merely because an individual belong[s] to a group, some members of which committed acts of violence.” In fact, the Supreme Court has long “disapproved governmental action . . . denying rights and privileges solely because of a citizen’s association with an unpopular organization.” Healy v. James, 408 U.S. 169, 185-86 (1972). The outcome of this trial is likely a looking-glass into the future of the government’s one- sided war against motorcycle clubs. Australia, Europe, and Canada have all focused on various strategies to make motorcycle club membership illegal. The MPP believes that trademark forfeiture is American law enforcement’s attempt to achieve the same outcome. None of those countries have a 1st Amendment. If the government succeeds in this case, our fundamental understanding of the protections the 1st Amendment provides will be completely rewritten. Of course, this case is in a district court. Precedent will not be created until the decision is ultimately appealed and decided by a higher court. Regardless, even success at the district court level will embolden the US Attorney’s office to employ this strategy against other motorcycle clubs and ultimately other organizations. The post US Attorney’s Embarrassing Closing at Mongols MC Trial appeared first on Motorcycle Profiling Project. This entry was posted in Motorcycle Profiling Project on December 4, 2018 by Webmaster.